last month's trip to Phoenix, AZ was a DREAM. y'all hear me!? i have been rocking with Sprouts Farmers Market for years now so honored is an understatement. myself along with 9 other ladies were invited to Sprout's annual blogger retreat; this year's theme was #PlantBasedGetaway. i had only heard about how beautiful and hot AZ was, so i was ecstatic to see and feel this "dry heat" people speak of for myself. i attended and blogged about the Katy, TX store opening back in 2013, and now *drumroll* Sugar Land will have their very own location in a few short months (Feb 2019)! there are SFMs popping up all across the country and hopefully right next to YOU! my local Sprouts has so graciously supported and provided healthy snacks for several of my past fitness events over the years; i am so grateful and practically leaped at the chance to learn more about the processes and people who make Sprouts one of my absolute favorite grocery stores. the cutest welcome tote bags full of goodies waited for us in our hotel rooms! i shared my airplane ride with my fellow blogger girlfriend, Mary Ellen, and our flight was delayed twice, ugh. all i could think about was missing the welcome dinner we were supposed to attend shortly after we arrived, booo. welp, we made eeeeet! i was excited to sit down and meet the other ladies, get to know more about our gracious hosts Diego and Erin, and have a nourishing meal at TFK, one of my fave places to dine. finally went with the ancient grains bowl + salmon, a kale-aid, and i got a few scoops of one of the many scrumptious desserts ordered, the strawberry & rhubarb crisp. after dinner, some of the girls mentioned they were up for an early morning cycle class and y'all know that was right up my alley! 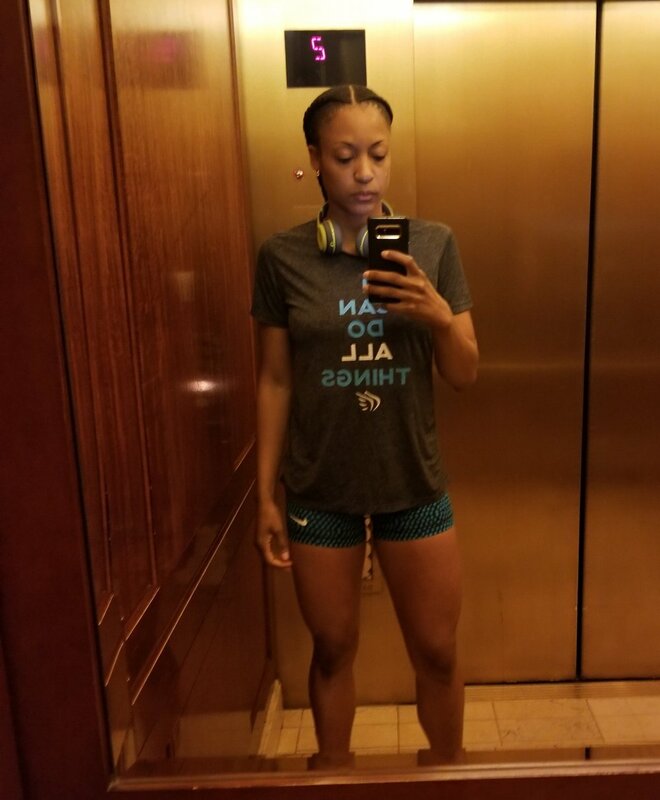 i was up and out around 5ish to get in a quick lifting session in the hotel gym before meeting up with the girls and heading on over to Flywheel. as a fellow instructor i can't help but notice, well, everything about another instructor's teaching style, sayings, cueing, music, etc., etc., etc, and i must say... Kristin absolutely killed it. and us. she's got the monday morning 6am slot for goodness sakes; she has no choice! we left feeling so inspired, awake, sweaty, and ready to attack our full itinerary. after a healthy hotel brekky of course! we spent our first morning listening to our super cool, knowledgable, down-to-earth hosts, Diego and Erin, the VP of grocery, and a few department in-store department managers give us an in-depth store tour. we then sat down to taste some staple, trending, and unique products like MTC oil, corn chips and guac, crushed tomatoes, diary-free yogurts, and soda kombacha. that alone keeps me coming back, guys. some the best cherries in life for only 97 cents a pound? strawberries for 88 cents a lb? unheard of! their seletcions always super fresh and affordable. we eat so much produce under this roof we should totally have our own backyard garden by now. but if you've followed me long enough then you'd remember my mom kept her green thumb all to herself and that i'm a serial #houseplantkiller. Sprouts always comes through and keeps us and our bank account stocked. visiting the Sprouts Headquarters later that day was unforgettable. we walked in and were greeted warmly! there was even a mini SFM on the first floor for the employees! so. cool. we were treated like royalty and given more samples and info than we knew what to do with for 4 days straight. we ate a big, vegan and vegetarian-friendly, plant-based feast with some of the major players on the Sprouts team. Reason #TWO. Private Label Love i was uber impressed with the quality and variety of Sprouts’ private label products! most times i just buy the brand i'm used to buying (even if it's most expensive in the lineup) and never truly give private label products a chance. we tasted several of them at the Sprouts Brand Presentation and New Product Review-- snacks i would prolly never pick up on my personal shopping trips. well let me tell you! i didn't even get off my plane home good before Coconut Rolls were in my mouth. lol. 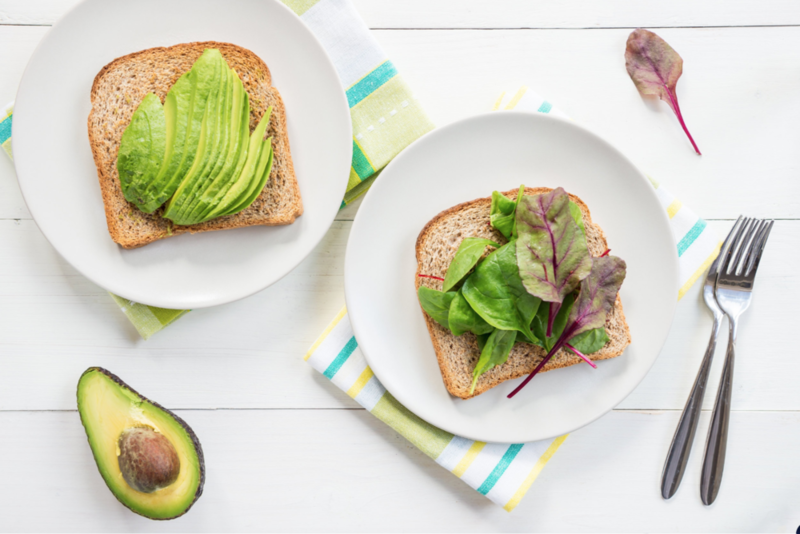 Sprouts private label shopping keeps prices down and are held to a high standard with an emphasis on organic, non-GMO, and natural ingredients. yes! that is the goal, friends. from popcorn to pizza sauce, we are Sprouts brand fans. in agreement with all of this! are you? back to the z hotel for a mini makeover and small break before dinner. good thing cause someone was hangry. and we even got to take home a ton of Andalou Naturals goodies to try. we had a fun, interactive dinner with the Melissa's Produce team that night, and it was all about JACKFRUIT. oh the possibilities! we took a cooking class hosted by Sur La Table and they taught us how to prepare jackfruit several ways. such a versatile fruit! we made grilled, vegetarian kebobs at our stations for our main course. dessert was fresh young coconut shells piled high with some of the fresh, exotic fruit i'm too intimidated to actually buy at the store and bring home! dragon fruit, pitaya, cherimoya....are any of these staples in your home? we were back at it again to learn all about sustainability! we visited another local Sprouts location for a behind-the-scences tour and heard from some of their leaders. and support local farms by providing food for animal feed and enriching soils with nutrient-rich compost. this just sits right with my soul, you know? i've witnessed pounds upon pounds of perfectly good food being thrown out because of some silly "laws" and it is not a good feeling. so many options to exhaust first to help both humans and the environment. new Sprouts stores are being setup with recycling in the forefront, and the older stores are following suit. last year, Sprouts stores recycled over 70 million pounds of cardboard! what an accomplishment! Reason #FIVE. Sprouts puts substantial effort into energy efficiency. as we wrapped up the sustainability tour, our presenter pointed out numerous things i would have never noticed as a shopper. solar energy is an unlimited resource and Sprouts takes advantage of it through the use of skylights! about 70% of their stores harvest light this way which reduces energy costs as well as harmful emissions. back to Sprouts Headquarters one last time for lunch and more workshops! 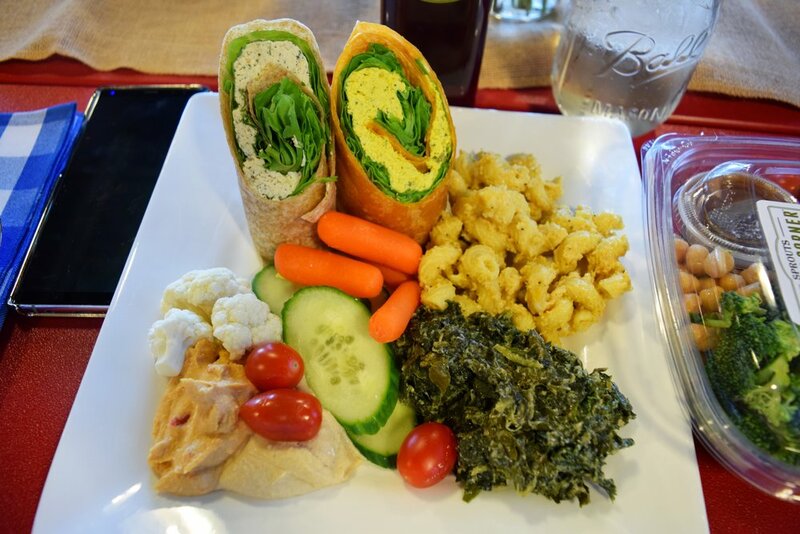 we were served a DELICIOUS, yummy vegan lunch and we even got to sample some of the vegan recipes coming to their prepared foods department very soon. what an honor that was. cannot WAIT to get my hands on that butternut mac n cheese and creamed spinach, ow! next...more food of course! 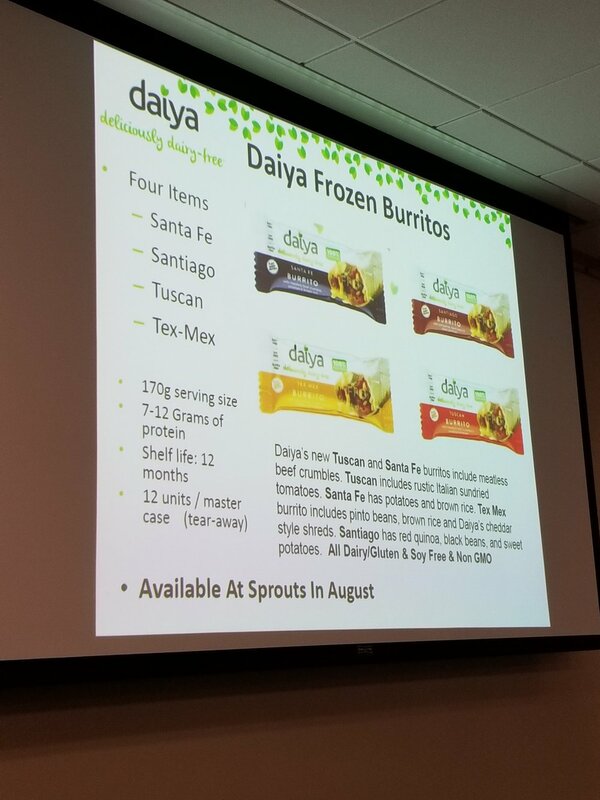 we attended workshops hosted by some of our favorite brands found at Sprouts including Daiya Foods and So Delicious and they fed us until we absolutely could not eat anymore. it was everything. Daiya let us in on a little secret they've been cooking up: vegan burritos! coming in august, peeps! i honestly loved them all but if i had to choose, tex mex would be my #1. i know, I know, here i go with the black beans and corn thing again. these creamy, frozen vegan bars are already in stores (have you tried them??) but we got to sample each one, yum. again, salted caramel keeps coming out on top to me every single time. before dinner later with the crew, i hit the pool with my babies! on our very last day, we scurried off to an appointment at the Desert Botanical Gardens for a service project with the Sprouts Healthy Communities Foundation. i left a lil' early to go shoot an in-store video before catching my flight! i left in the middle of our very last presentation and i truly hate i didn't get to have lunch with the girls one last time or at least hug any of them! thankfully we have been staying in contact and keeping up with each other via good ol' social media. I am honored that someone felt i was cool enough to shoot this super cool in-store video that will be released next month!!! my lunch was the yummy turkey and avocado sammich i ate while sitting in the airport waiting for my flight. thanks for reading and don't forget to follow Sprouts on Insta, Twitter, and Facebook! download their mobile app for coupons, recipes, weekly deals and more!